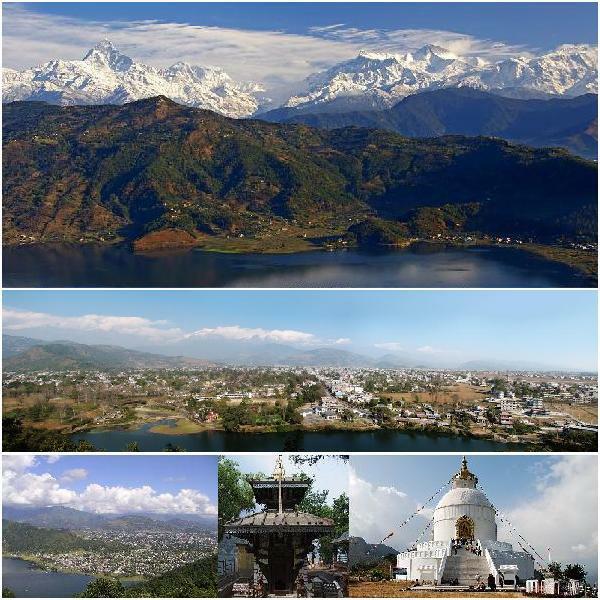 Pokhara is situated at an elevation of 915m above sea level and 200km west of Kathmandu. The rich ness of valley in pure natural beauty is indeed one of the main attractions to the visitors from all over the world. Just imagine the joy of observing the majestic Himalayas, three peaks above 8000m from an elevation of below 1000m within a very close aerial, distance. The valley is equally superb giving as they do elevated close-ups to the snowy peaks. The serenity of Phewa Lake and the magnificence summits like Machhapuchhre (Fishtail) (6977m) and the five peaks of Annapurna range rising behind it create an ambience of peace and magic. Pokhara is the land of the Magars and Gurungs who have earned worldwide fame as Gurkha soldiers. Brahmins, Chhetris and Thakalis are other major communities here. Hotel Barahi provides comfortable and scrupulously clean accommodation. Rooms are well facilitated and include private balcony to witness the majestic view of the Fishtail Mountain and the Annapurna range. All rooms come with en-suite lavatory, with all the necessary amenities attached. Phewa Lake, the second largest lake in the country, is the center of all attraction in Pokhara. It is the largest and most enchanting of the three lakes that add to the resplendence of Pokhara. Here, one can sail or row a hired boat across the lake to visit the island temple in its middle. The eastern shore, popularly known as lakeside or Baidam, is the favorite home base for travelers and is where most of the hotels, restaurants and handicraft shops are located. The Barahi temple is the most important monument in Pokhara; Built almost in the center of Phewa Lake, this two-storied pagoda is dedicated to the boar manifestation of Ajima, the protector deity representing the female force Shakti. Devotees can be seen, especially on Saturdays, carrying male animals and fowl across the lake to be sacrificed to the deity. Locally known as the Patale Chhango (Hell's Fall). David's Fall (also known as Devin's and Devi's) is a lovely waterfall lying about two km south-west of the Pokhara airport on the Siddhartha Highway. Legend has it that a trekker called David as washed away by the Pardi Khola and mysteriously disappeared into an underground passage beneath the fall. Gupteshwor Cave is also known as the Gupteshwor Gupha. The Gupteshwor Cave holds a special religious importance especially to the local people. This cave is regarded holy by the Hindus. The main highlight of the site is the Shivalinga, the phallic symbol of the Lord Shiva. The linga is preserved here in the condition it was discovered. It is just across the Devi’s Fall. From the end of the cave, you can see the view of Davis Fall. Tibetan Handicraft center know as the Tibetan refugee camp. And it is the pioneer of Tibetan carpet industry in Pokhara, Nepal. This center provides job to Tibetans from the camp and local Nepalese. The profits of the handicraft center is used for the education, health care, sanitation, looked after old age and physically handicapped Tibetan people of this refugee camp. An enjoyable and scenic five hours drive by car or private vehicle on the Prithvi highway connecting Chitwan with Kathmandu follows the Trishuli River takes us through the Tharu Villages of Chitwan . The ethnic tribe of the Tharu’s is the local inhabitants of Chitwan and isagriculturists by profession. The drive finally brings us to the Tigerland Safari Resort. habits of elephant. Here one may witness the rare scene of the elephants at bath. crocodiles, fresh water dolphins, otters and varieties of water birds. You may also feel like going for a nature walk or birding with one of our naturalists to know more about the flora of the Chitwan National Park Those on canoe ride are taken back to the resort four wheel drive jeep from the endpoint. After breakfast in the morning, since Chitwan is a bird paradise of resident and migratory birds, making it a delightful and educational experience for every bird watcher. Special bird watching tour can be arranged too. Those who could not go for elephant safari on the day of arrival would go for elephant safari to penetrate deep into the jungle for viewing and photographing wildlife and those on a jungle walk can experience the abundant bird life and the flora and fauna of the park Then after, the guests will be transferred by Jeep or by coach to Bharatpur Airport for flight to Kathmandu. The price does not include: undue escalation in fuel prices, new taxes levies on hotels and transportation services or any hikes in entrance fees. Any large tax hikes and new levies shall be payable extra and shall be billed accordingly with prior notice.